Camping is lots of fun spent away from home and its also time spent away from your workshop and toolbox. There will be necessary repairs to be made while you are using your camping gear and you may not have all the necessary material on hand at the time. You know the old saying that duct tape is all you need. It’s meant to be tongue in cheek but there really are tons of uses for a roll of duct tape and a handful of bungee cords at the campsite. With a handy roll of the standard silver stuff you can mend a tear in your tent, shore up a split chair leg, or hang it in the RV as a homemade strip to trap flies. You can tape your tablecloth down on a windy day and secure a leaking cooler. You can even use it to fashion a rope, if need be, or soften a sharp edge you’ve found in the furniture. 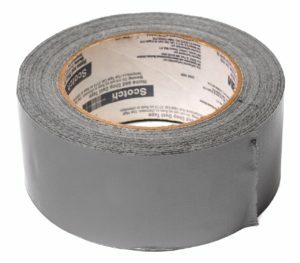 It’s amazing how many things you can find to fix with good old duct tape to be sure to bring a roll or two with you when you’re camping. Bungee cords are another useful item to bring along. They can be used to make a clothesline or hold items from sliding as you travel in the RV. You can use them to bundle pieces of wood or blankets and pillows. Anything that threatens to slide around can be controlled by hooking a few bungees together to regain control. Bring a variety of sizes with you and you’ll have just the ones you need for any circumstance you need to fix.